The new plan calls for packing waste into capsules and burning them in a waste-to-energy incinerator. Pattaya officials insist they want to locate the city’s new garbage dump in Khao Maikaew despite years of protest from local residents. Mayor Anan Charoen­chasri chaired a Dec. 19 meeting on Pattaya’s trash crisis with consultants from King Mongkut’s University of Technology, North Bangkok and relevant agencies. 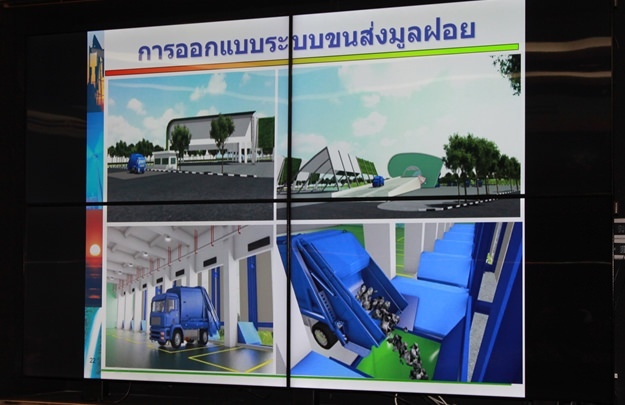 The initial plan for the “Cluster 2” project estimates construction of a new waste-processing facility will cost 3.3 billion baht. But details of the plan are being withheld due to renewed objections from the Banglamung sub-district, which resents Pattaya using its community as its dumpsite. Anan said Pattaya is actively pursuing negotiations with Khao Maikaew officials and community leaders to get them to agree to locate the landfill and incinerator in their backyard, promising more-effective steps will be taken to mitigate the environmental impact. At a Nov. 29 meeting, Khao Maikaew Mayor Jamnien Keeteepakul joined residents in opposing the plan, saying they’ve been Pattaya’s dumping ground for 30 years and, if the city wants to build a new dump, it should find another city to victimize. King Mongkut project advisor Somrath Kerdsuwan said the new plan calls for packing waste into capsules and burning them in a waste-to-energy incinerator that he claimed would cause little pollution in Khao Maikaew. In 2012, more than a year of disputes with residents began, with locals demonstrating against the 400 tons of Pattaya garbage being dumped in their backyards a day. Neighbors started barricading the entrance to the dump to protest extra-stinky garbage deposits from Koh Larn. Intermittent blockades became temporary closures which became a permanent closure in late 2013. Previous articleProstate Cancer – demystified – and – is the PSA worthwhile?